[S11] Alison Weir, Britain's Royal Families: The Complete Genealogy (London, U.K.: The Bodley Head, 1999), page 148. Hereinafter cited as Britain's Royal Families. He gained the title of Duke of Albany on 20 October 1509.1,3 He gained the title of Duke of Rothesay. [S6] G.E. Cokayne; with Vicary Gibbs, H.A. Doubleday, Geoffrey H. White, Duncan Warrand and Lord Howard de Walden, editors, The Complete Peerage of England, Scotland, Ireland, Great Britain and the United Kingdom, Extant, Extinct or Dormant, new ed., 13 volumes in 14 (1910-1959; reprint in 6 volumes, Gloucester, U.K.: Alan Sutton Publishing, 2000), volume I, page 82, does not confirm teh existence of this title for Arthur, son of King James IV, and it is doubtful that he was styled Duke of Albany. Hereinafter cited as The Complete Peerage. 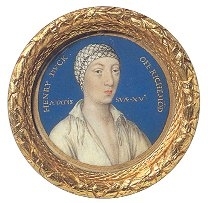 Henry Fitzroy, 1st Duke of Richmond was born in 1519 illegitimately.3 He was the son of Henry VIII Tudor, King of England and Elizabeth Blount.1 He married Lady Mary Howard, daughter of Thomas Howard, 3rd Duke of Norfolk and Lady Elizabeth Stafford, after 26 November 1533, although the marriage was not consumated.1 He died on 22 July 1536 without issue.1 He was buried at St. Michaels, Framlingham, Suffolk, EnglandG. [S8294] Peter and Roger Powell Beauclerk-Dewar, Right Royal Bastards: The fruits of passion (Wilmington, Delaware: Burkes Peerage & Gentry, 2006), page 10. Hereinafter cited as Right Royal Bastards. He gained the title of Duke of Cornwall. [S11] Alison Weir, Britain's Royal Families: The Complete Genealogy (London, U.K.: The Bodley Head, 1999), page 152. Hereinafter cited as Britain's Royal Families.